The EFF have targeted Smokehouse and Grill and can be seen jumping on tables at the Braamfontein restaurant. 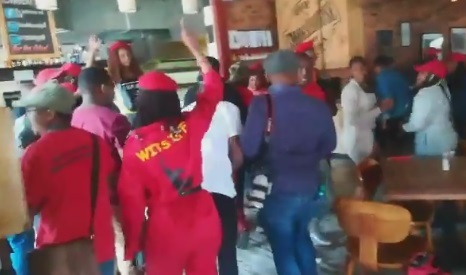 The EFF invaded the Smokehouse and Grill restaurant on Thursday, as it was once associated with Adam Catzavelos, who famously said on holiday in Greece that the beach he was on was great due to the lack of “k***irs”. Smokehouse and Grill was in the news recently due to its links to the Catzavelos family’s business concerns. According to a statement issued by the family and St George’s Fine foods, Adam was no longer a part of the Smokehouse and Grill and added that his 25% passive interest in the restaurant was being unwound. The family have issued an apology for the hurt and harm Adam’s words had caused. He also personally apologised. It was unclear what the EFF’s demands were after they arrived at the restaurant in Braamfontein shortly after lunch. The group in red and black regalia can be seen chanting Asinalo uvalo in unison, meaning they “no longer had fear in what they do”. The EFF have opened a criminal case against Catzavelos at the Bramley police station. Led by their Gauteng chairperson Mandisa Mashego, the EFF want his to account for his actions.